Two hundred exhausted firefighters are battling the blaze and deserve to be recognised as the heroes they are. A high-rise tower block with hundreds of residents live was engulfed by a blazing inferno in the early hours of this morning, leaving people trapped and desperate - reliant on the help of hero firefighters. Parents were resorting to throwing their babies and children from windows in the hope of saving their lives as the intense heat raged through their homes in 24-storey Grenfell Tower, west London. The capital's emergency services responded, as usual, quickly and professionally. Hundreds of firefighters, paramedics, triage medics and nurses ran towards danger to try to save lives. But false information is being shared on social media about the length of time firefighters took to respond. At 4.12am one person wrote on Twitter: "WHERE ARE THE FIREFIGHTERS? THAT THE F*** IS TAKING SO LONG!? Fire getting out of control, people still trapped in Grenfell Tower , Latimer Road." She then added: "One woman said it took them 2 hours to arrive when their station is 2 block away." The woman who shared the false information on Twitter appears to be Palestinian and Canadian and might not even live in London. Another wrote: "The firefighters were about 1 hour and 45 minutes too late." It's not clear whether people have read information somewhere online and misunderstood it or they are sharing lies in order to discredit the emergency services. The first responders from London Fire Brigade arrived at Grenfell Tower within six minutes. London Fire Commissioner Dany Cotton held a press conference, broadcast this morning on BBC Breakfast, in which she confirmed there had been fatalities. 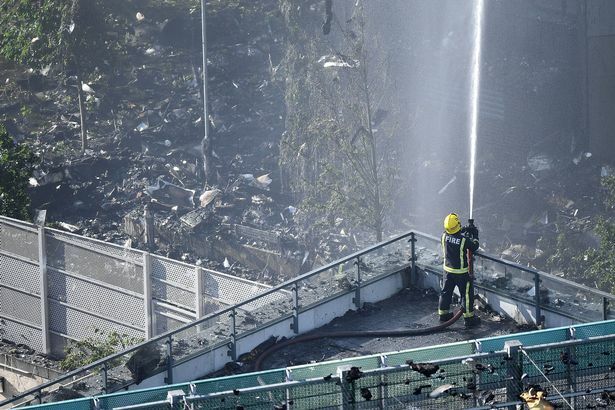 She said that the first 999 call was received at 12.54am and firefighters were on the scene within six minutes to begin extinguishing the blaze. Two hundred firefighters have been battling the flames at the tower, taking it in turns to rest. In an interview with CNN, a nurse who lives nearby - and who rushed towards the scene to save victims - told how firefighters were stumbling out of the building injured despite wearing protective gear. Mirror reporter Andy Lines is at the scene and has repeatedly spoken of the bravery of firefighters going back in to save trapped victims. Just walked past six hero firefighters - 4 men and 2 women - striding towards fire. Full gear on. "We're going in now" overheard one say. Just seen a squad of 30 firefighters put on full gear and are marching through the cordon towards the blazing building. Several exhausted firefighters sitting by a wall on Ladbroke Grove. They have been attending to women collapsing on the street. A woman collapsed to the ground and the firefighters are with her now. Local shopkeepers are leaving food out for the exhausted heroes. Reports saying London firefighters sat on the blaze for two hours before aiding.